PM Exam Simulator Review: So you have been looking for a good PMP Exam Simulator and haven’t been able to decide which one to buy. I can understand your dilemma. There are just too many of them out there and each claims to be the best and the most realistic PMP exam simulator. It’s certainly not an easy choice. Today I had a chance to test drive a new PMP exam simulator - PM Exam Simulator - from the publisher of the ground-breaking PM Prepcast. I spent the most part of the day testing the tool. In this post, I’m going to share my experience and views about this new tool, and hopefully help to confuse you more, oops, I mean help you make an informed decision. The review is divided into 3 sections. First I’ll list the features of the tool, then I’ll talk about the pros and cons, and finally give my verdict. Note that this is an independent review and is solely based on my personal opinion. It has not been shared with the publisher before. UPDATE: I’m pleased to inform you that the publisher took serious note of this review and based on my feedback they have already addressed some issues, and are in the process of addressing a few other. I struck those points out that have been addressed. The conclusion and original rating remain unchanged as of now. Very slick and intuitive user interface. It's very close to that of the real PMP exam, though a bit more colorful. The Review mode is also very similar to that in the real exam. The interface is the best among all the exam simulators I've tried. Separate 'Quiz' mode, which allows you to take Timed as well as Learning quizzes. The Quiz mode lets you to make your own exam by specifying the number of questions and the domain. This is a very handy feature when you have a limited amount of time to take the exam (commuting for work, lunch breaks etc.). Lists of top ten scorers, last ten exam takers etc. on the home page. This develops a sense of competition among the users, but has a flip-side too. See the 'cons' section below. Removed based on my feedback. In the Review mode, you can submit your feedback on each question. This allows for continuous improvement of the tool. And if you get a question wrong, you can use this option to express your frustration too! Option to rate difficulty level of each question. Although this feature doesn't seem useful right away, the data collected through this could be used in future to add new categories (for example an exam of difficult questions). The score report. It's quite detailed and shows the result by domains as well as knowledge areas. It also shows the time taken per question. The score report is emailed to you after the exam. Option to view all the past results in detail. The application software is quite stable. I had no crashes or freezes during my testing. Huge question bank of 1800 sample questions. This tool along with a selected set of free PMP sample exams, is all the practice that you need to pass the PMP exam. In the 'Exam' mode, the domain-wise distribution of questions matches the specifications given by PMI. A separate exam dedicated to ITTO-based questions. ITTOs are among the biggest worry for the PMP aspirants, and this tool is heavily weighed in that direction (in fact too heavily - read the 'cons' section for more on this). The questions are scripted well, particularly the wordy ones. The answer explanation will not only tell you why the correct choice is correct, but also why the incorrect ones are so. This is a hallmark of any good exam simulator. The answer explanation also provides reference to the source. What I found particularly neat is that it not only gives reference to the PMBOK Guide, but also (in many cases) to online resources such as PMP forums, PMP Study Guides and Wikipedia pages. Quite a number of wordy questions (maybe a tad too wordy at times). Plenty of situational questions, as you would expect to see on the real PMP exam. Try before you actually buy: You can sign up for a free 7-day trial account that gives you access to two 30-question exams. Comes with a 2-week money back guarantee. Questions are developed by certified PMPs and the publisher is a PMI Registered Educational Provider (R.E.P.). Bonus items - access to Prepcast exam forum, email-based course, test worksheets, and more. Video tours to help you discover all the features of the tool quickly. No option to save the exams. However, if you happen to close the exam without ending it properly, it does get saved, and you can continue from where you left off. My complaint is more about the ability to save multiple exams at any given point. The loading of questions seems to be a bit slow, specially if you are on a slow internet connection. On my 1 Mbps line, it took an average of 3 secs to load each question. This adds up to a significant amount of time for a 200-question exam, specially if you go back and forth. I don't think that the delay is this significant on the real PMP exam. No separate category of exam for difficult questions (like "Super PMP"). I would like to see more categories on the 'Quiz' mode such as All Formulas questions, All EVM questions, etc. No diagnostics tools to help identify overall domain-wise strengths and weaknesses. No graphs - the results are completely text-based. Bring on some bar charts and trend reports. Your real name and score is displayed in the "Last 10 results" at the bottom of the home screen. It's not such a great thing for not-so-bright people like me who usually score low. I would like to see some privacy settings there. Fixed based on my feedback. No question with diagrams or exhibits. That's a bit of a surprise for me. Surely the real PMP exam has questions with exhibits. The wordy and situational questions are mostly limited to the Professional and Social Responsibility domain or the HR Management knowledge area. I didn't see too many situational questions in other areas. Questions in other areas seem to be heavily weighed toward PMBOK Processes, Inputs, Tools and Techniques, and Outputs (ITTO). Not many out-of-the-blue questions. Out of the 400-odd questions that I sampled, a good percentage of them could be answered straight from the PMBOK Guide. I didn't see very many questions with terms not seen or heard before. Not enough ambiguity in questions and answer choices. I didn't find myself scratching my head between 2 options on too many occasions, like most people find themselves doing on the real exam. Maybe it's just that I don't have enough dandruff in my head. Jokes aside, even the competition isn't doing any better on this aspect. 25 pre-test question simulation is missing. Remember that in the real PMP exam, 25 out of the 200 questions are not counted in your final score. I have seen at least one other exam simulator that tries to simulate the pre-test question behavior as well. It randomly marks 25 questions as pre-test questions and calculates the final score out of the remaining 175 questions. This feature won't help you prepare any better, but just make the tool more interesting. Grammatical problems. Though most of the questions are worded well, I found a few instances where the answer choices didn't grammatically agree with the question. While I'm not an English grammar expert, I did see some obvious problems. By the way, you can also expect to see similar issues on the real PMP exam, which is not known to appease the taste buds of English Grammar Gurus. Fixed based on my feedback. No ala carte purchase option. You cannot just buy selected exams. You must buy the complete package. At this price, it isn’t the most economical option out there, but it’s also not the most expensive either. Maybe it’s just me because essentially it works out to be $11 per exam ($100 for 9 full-length exams). Overall, the PM Exam Simulator is not perfect, but it’s certainly one of the better ones among the competition. 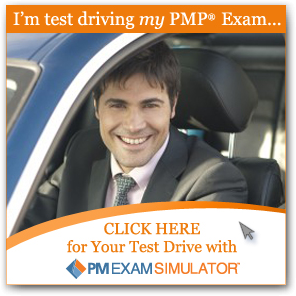 It has a very neat simulator engine, which brings you as close to the real PMP exam, as it gets. There’s some room for improvement in the content section, and I’m sure that it will come about very soon. Sometimes, I can be a bit too critical in my reviews. In terms of the ‘cons’ that I listed above, I can tell you that most of the competing products aren’t doing any better. Some of the items are in fact more of my wish-list things. My rating for the software is 4 out of 5, and the content is 3.5 out of 5. Overall, considering the pricing, I’ll give it 4 out of 5. If you are in the market for a good PMP exam simulator, you cannot go wrong with this one. Test it yourself now with a free 7-day trial account. When I recommend a product, I’m putting the credibility of this site at stake. Therefore, I recommend only those products that I genuinely believe will help people in their PMP exam preparation. If you purchase this product, you’ll be contributing toward the maintenance of this site and enabling me to bring more quality content your way. Difference between Planned Value, Earned Value, and Actual Cost in Earned Value Management under Project Cost Management. The important question is or should be "Does this simulation help produce better project managers"? And if the answer is no, then is it something the true professional practitioner should be supporting or endorsing? This post is meant to be review of a tool, and that's all it is. The tool does help people pass the PMP exam. Thank you for your insights and opinions on this, I was looking for a recommendation on exactly this topic! If this tool helps me pass my PMP exam then this is a good tool and a good review. I'm happy to pay $90 and have 9 practice exams (close enough to being like the real exam) and then be able to walk into my exam fully confident. By the way, do you have a section where you keep your product reviews and your ratings at a glance? It would help me spend my money wisely. The tool will definitely help, but I'll still advise taking 4-5 good 'free' exams for a more wholesome view. Regarding other reviews, click on the "REVIEWS" link in the menu bar on the top. Or you can click on the "Review" link in the "Categories" list on the right. Is it updated as per the new PMI exam structure. In fact, I have no idea about how the 30% change will reflect in exams. I just checked their website and confirmed that the simulator was updated on Aug 15, 2011 for the new PMP exam changes coming into effect on Aug 31, 2011. I've now added that note to the post above. Lot of free questions inside, divided into Processes and K.A. I am using it also for my studies. Since you are the expert in PMP, kindly let me know about the questions available in this site. I am taking PMP exam on 4th April. So kindly assist me Sir. I’ve not review Exam Central questions, but I know it exists and offers 1000+ free questions. Currently, I’ve too many things on my plate, and may not have the time to review it. I suggest that you post this question in PM Hangout forum. There are a few members who have recently passed the PMP exam, and some are preparing currently. You may be able to get some good feedback from them. Good luck for your exam. Could you tell me how real life the questions in the simulator are? i.e If I score an average of 70% in the PM Simulator, is it a good indication of passing the real exam? I purchased the pm exam simulator and took all the 9 exams before my scheduled exams. I found the questions to be a lot easier than the ones on the actual exam. I could finish most of the tests in about 3 hours and didn't need to spend much time contemplating between options. This was not the case on the real exam where I mostly found myself torn between two options as most of the questions were situational with no obviously wrong answer. That said it is still a good tool to test your understanding and memory. Thanks for sharing your review, Zoe! I hope to see more of such reviews from other readers. I have subscribed to the Prepcast Test simulator and the feel and design seems good. I am told - just like in the exam. But the quality of the questions leaves a lot to be desired. It was recently updated to be on par with the new PMP exam but I found that there are too many ITTO questions about input, output and Tools and techniques which is hardly found in the real exam. Most of the question in the real exam are SITUATIONAL questions. I am looking for a simulator that provides that apart from Rita's Fastrack which is good. Any good viable suggestions? I think Rita's Fastrack, PM Exam Simulator (for what it's worth), and a few free mock exams from the page above should put you into good shape for the real exam.